Ambassador Carlos C. Salinas chairing the 6th Annual Meeting with Philippine Honorary Consular Officers in Andorra and Spain. The yearly event, which was initiated in 2011 by Ambassador Carlos C. Salinas, gave the nine (9) Honorary Consular Officers in Andorra and Spain the opportunity to discuss problems, share best practices, solicit advice and recommend policies and possible programs/activities. Embassy officials, for their part, gave updates on the latest Philippine policies, laws and regulations that are pertinent to the work of the Honorary Consuls. 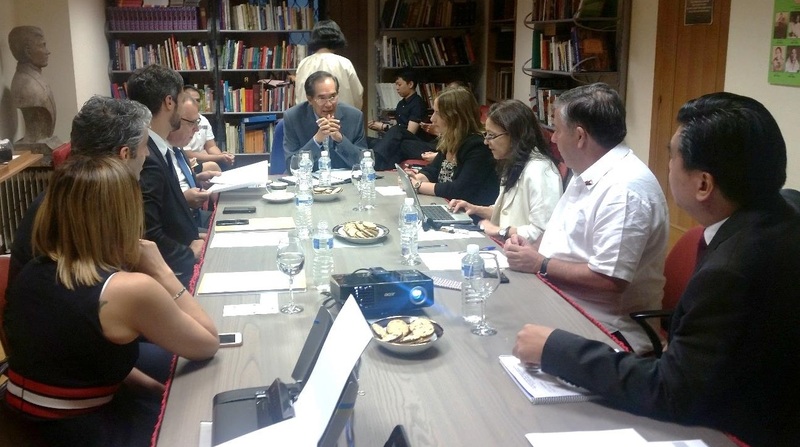 More importantly, the meeting once again gave the opportunity for the Honorary Consuls and Embassy officials to strengthen their sense of being a team in the service of the Philippines and of Filipinos in Spain and Andorra. In his opening message, Ambassador Salinas challenged the Honorary Consular officers to undertake further initiatives towards a more dynamic cooperation between Spain and the Philippines. Ambassador Salinas said that, while much has been done in this regard during the past five years, the two countries still have huge potentials in terms of tourism and commercial exchanges. Discussions ranging from consular procedures and regulations, business and tourism prospects, political updates and financial and administrative concerns were actively participated in by the Honorary Consuls. Consul General Emmanuel R. Fernandez also held one-on-one consultations with each of the Honorary Consuls to discuss their performance assessment reports and their work plan for the current year. The Embassy believes that these on-on-one consultations will ensure that each Honorary Consul will be aligning his or her work plan with the goals and objectives of the Embassy and the DFA in general. In his message, Consul General Fernandez also thanked the Honorary Consuls for their commitment to serve our country and people, and encouraged them to continue translating that commitment into concrete programs and projects in their respective jurisdictions.